GSEB Prakharta Shodh Kasoti 2019: Gujarat Secondary and Higher Secondary Education Board Published Notification of TST 2019 for Standard 9th Students. Prakharta Shodh Kasoti Application Only Online Mode. School Use Index number and Password for Online Application. More details about the exam will be available at the official website @ prakharata.gseb.org. 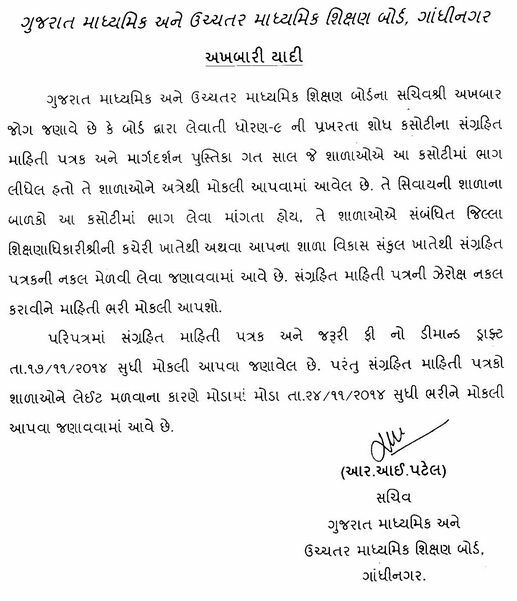 Gujarat Secondary and Higher Secondary Education Board Published Notification of GSEB Prakharta Shodh Kasoti for Standard 9. Je School Na Students Bhag Leva Mangta Hoy te Paripatra Ma Sangrahit Mahiti Patrak and Jaruri Fee Ni DD Date 24/11/2014 Su dhi Bharine Mokli Aapva Janavvama Aave Chhe.